Very few days are left for diwali even stock market is also making moves between up & down. Many investors are in confusion state which stock they should pick for this diwali to earn good return for whole year. 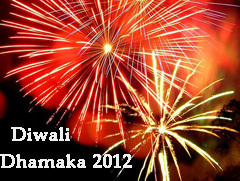 On occasion of diwali we are herewith expert stock picks. As per expert you can purchase this stock and expect decent returns during year. Expert views from various broking houses are collected and consolidated list of top large, med and small cap Diwali picks is made which is given here. a target price of Rs 1,476. Crompton Greaves (CG), part of the USD 4 billion Avantha Group, is one of the leading players in the power T&D equipment business in India. The company operates across three segments – power systems, consumer products and industrial systems. We maintain our positive stance on the company. We have assigned an EV/sales multiple of 0.7x to arrive at a target price of Rs 145, implying on upside 16% from the current levels. ICICI Bank’s substantial branch expansion (from 955 branches at the end of 3QFY2008 to 2,772 branches by 2QFY2013) and strong capital adequacy at 18.3% (tier-1 at 12.8%) have positioned it to gain CASA and credit market share, respectively. We maintain our Buy view on the stock with target price of Rs 1,270, valuing the core bank at 2.2x FY2014E P/ABV and assigning a value of Rs 153to its subsidiary. Lupin is one of the highest filers of ANDAs in the Indian pharmaceuticals industry. As of FY2012, the company’s cumulative filings stood at 173, of which 64 have been approved. Lupin plans to launch 20 products in the US in FY2013 and another 80 products over the next three years, including nine exclusives. We maintain our Buy rating on the stock with a revised target price of Rs 652. DB Corp is one of the leading publishing houses in India, with seven newspapers and 65 editions in four languages across 13 states. The company has an advertising focused revenue model with average cover prices being the lowest among peers at Rs2.6. Maintain our Buy view on the stock with a target price of Rs 259. United Phosphorus (UPL) figures among the top five generic agrichemical players in the world, with a presence across major markets such as the U.S., EU, Latin America and India. Over FY2012-14E, we estimate UPL to post a 10% and 18.4% CAGR in its sales and PAT, respectively. Currently, the stock is trading at an attractive valuation of 6.7x FY2014E EPS. Hence, we maintain our Buy view on the stock with a target price of Rs 170. SpiceJet has the lowest debt amongst all listed players at Rs 10.09 billion, compared to Kingfisher Airlines (Rs 87.19 billion) and Jet Airways (Rs 131.57 billion) as of FY2012. Presence in the high-growth, low-cost segment and having the lowest debt compared to peers makes FDI investment in SpiceJet more lucrative than others. On the valuation front, SpiceJet is trading at EV/sales of just 0.3x FY2014E, lower than its peers. Hence we recommend a Buy rating on the stock. SBI is the market leader (18% market share) by a wide margin with a gross advances of Rs 9.45 trillion. It has led the rate cuts and is offering one of the lowest lending rate across the industry. In spite of this, it is maintaining one of the highest NIM at 3.7%. A strong operational performance led by NII enables SBI to cover up for higher provisioning and post decent profitability. Coal India (CIL), the largest coal producing company in the world, also enjoys a monopoly status in the Indian domestic market. CIL contributes 80-85% of the country’s total coal output and on the demand side meets 65-70% of domestic consumption requirements. Going forward, CIL is well poised to deliver healthy performance and is a priced asset to be held in one’s portfolio. JK Lakshmi Cement is a North India based cement company having an integrated cement plant with the capacity of 4.2 MTPA at Sirohi, Rajasthan and 0.55 MTPA each at Kalol (Gujarat) and Jhajjar (Haryana). We remain positive on the stock on account of capacity expansion led volume growth, improvement in margins and return ratios and cheap valuations. It is trading at USD 54/tonne at FY14E capacity of 8.1 MT, which is 55% discount to the current replacement cost. With falling copra prices, margins for the company should expand, going forward. Marico has high susceptibility to copra (CP) and safflower oil (SO) prices as they constitute 40% and 15%, respectively, of its raw material (RM) costs. We remain positive on the stock. The stock currently trades at 1.8x FY13E ABV and 1.6x FY14E ABV. We believe IDFC will get re-rated as its ROE expands and will continue to command premium within its peer group owing to its professional setup, experienced management team and diversified business model. Besides this, the company continues to maintain a cautious stance and has been prudently making provisions to cushion itself against any possible asset quality shocks. We expect a strong outperformance for the stock. The stock currently trades at 1.4x FY14E ABV and 9.7x FY14E EPS which is attractive, considering the bank’s strong prospects to grow above industry rate with better asset quality & adequate capitalization (no capital raising in the next two years). ING has undergone a significant transformation in its quality of earnings over the past few years under the new management team led by Bhandari. However, the bank trades at a discount to its peers owing to lower return ratios. Going forward, with all levers to improve return ratios in place, we believe the gap in terms of valuation should narrow down and thus presents a strong case for re-rating. Mahindra Satyam (MS) & Tech Mahindra (TM) both have shown tremendous resilience in overcoming their respective headwinds, especially in the last 5-6 quarters. We maintain our positive stance for its consistent performance and strong investments in the next wave of growth areas and geographies. Bajaj Auto is known for its best in class operating margin (20%) in the Auto OEM space. Since FY09, Bajaj is maintaining its industry best margin for 14 quarters (18-20%) despite headwinds from lower demand export disruption and intense competition Bajaj’s 20%), demand, competition. Bajaj s brand led strategy and superior product mix led by Discover, Pulsar and 3w has helped them to retain the high margins and grow at a healthy pace. Rajiv Bajaj’s high risk taking ability, brand led strategy and clear vision of transforming BAL into GLOBAL BAJAJ in Motorcycle segment augurs well for BAL in the medium to long term.